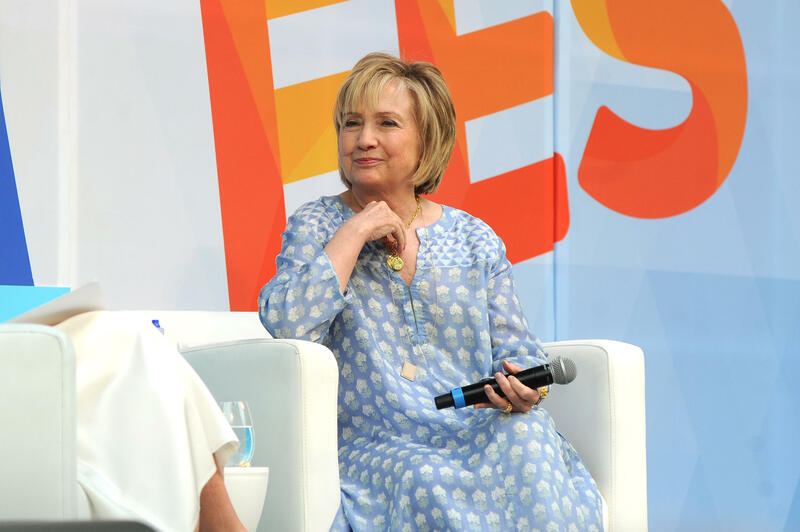 NEW YORK -- Hillary Clinton was cheered Saturday in Central Park when she took the stage as part of a star-studded summer festival of conversation, music and food. Clinton said "It's fair to say it was a broad and unfortunately successful attack on our electoral system." The former Democratic presidential candidate, secretary of state and U.S. senator from New York told a crowd at the OZY Fest that she'll be tweeting in coming days, helping to organize transportation for immigrants trying to reunite with their families after crossing the U.S. border illegally and being separated. She was interviewed by Laurene Powell Jobs, founder of the Emerson Collective, a nonprofit advocate of liberal causes that organized the two-day festival in the park's Rumsey Playfield that was to conclude Sunday. The subject was the "politics of the moment." Clinton also addressed this week's burning topic: Mr. Trump's encounter with Russian President Vladimir Putin in Helsinki, amid special counsel Robert Mueller's warning that Russian intelligence services have active "interference operations" in U.S. politics. "It's really distressing and alarming," Clinton said. "It should concern every American of any political party because this was a direct attack on our democracy." She said the United States has four main adversaries: Russia, China, North Korea and Iran. "If anyone gets away with the attack Russia did, it empowers them all to keep probing." As for the Helsinki meeting, "now we have Putin telling the world what was decided," she said, while "we're hearing crickets from the White House; nothing has been put out that contradicts or replaces Putin's agenda." Clinton described the Russian leader as a "very aggressive guy," and said she believes he "wants to dominate his neighborhood again." "In this case it seems like our president doesn't care," she said. "He wants to be friends with Putin for reasons we aren't sure of." Clinton concluded: "We are still very vulnerable." Other announced guests at the festival included comedians Michelle Wolf and Hasan Minhaj; the band Passion Pit; rapper Common; authors Malcolm Gladwell and Salman Rushdie.